Mark Durkan: What are the ex-SDLP leader's chances in EU poll? 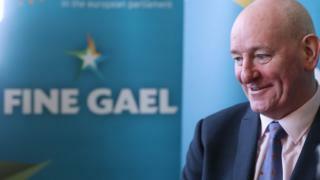 As the former SDLP leader Mark Durkan announces he will contest the European elections as candidate for the Republic of Ireland's ruling party, Fine Gael, BBC News NI assesses his chances. Mr Durkan may never have represented a Dublin constituency or have political roots in the city but that doesn't mean he is a complete no-hoper in the poll. It's a truism that elections are decided by campaigns and the issues of the moment and that be the case in a few weeks time too. But there are reasons to give Mr Durkan some hope. Because of Brexit, Dublin is to get one of the UK's seats, moving from a three-seat constituency to four seats. And while we don't yet know who all the candidates will be, we know that only Sinn Féin's Lynn Boylan is seeking re-election. That opens up the field in a contest that will be decided by transfers. The former tánaiste (Irish deputy prime minister) Frances Fitzgerald will be Fine Gael's leading and more recognisable candidate, but Mark Durkan can expect to attract transfers from other parties. That is partly out of past support for him and the SDLP and partly because of sympathy for people in Northern Ireland arising from Brexit. Dublin is good Fine Gael territory and many - not just supporters of the party - identify with what they see as the new, more liberal Ireland that its leader, Taoiseach (Irish Prime Minister) Leo Varadkar represents. Sinn Féin can be confident it will retain a seat; Ms Fitzgerald will also almost certainly be returned and after that several candidates will be hoping they will be in with a chance for the last two seats. They include Fianna Fáil's Barry Andrews; Labour's Alex White; Mr Durkan; possibly some as yet undeclared left or independent candidates and whoever the Green Party picks. The Greens tend to do well in European elections and are a transfer-friendly party. It will be a tough ask, but not impossible, for the former SDLP leader who will have to get as many first preference votes as possible to be in a position to benefit from transfers.